Persistence Market Research (PMR) analyzes the Automotive Parts Remanufacturing Market in its new publication titled “Automotive Parts Remanufacturing Market Global Industry Analysis 2013 – 2017 and Forecast 2018 – 2026”. This global study on the automotive Parts Remanufacturing provides data for 2017 along with the forecast for the period 2018 – 2026. The main objective of the global automotive parts remanufacturing report is to identify the dynamics in the market and provide recent updates that are affecting the various segments of the global automotive parts remanufacturing market. To provide a better understanding of the automotive parts remanufacturing market, the report also includes the analysis of global drivers, restraints and trends, which are influencing the current market scenario and will define the future status of the global automotive parts remanufacturing market over the forecast period. This Automotive Parts Remanufacturing market study includes various viewpoints of the global market, including value chain analysis, market dynamics, macro-economic factors, competition analysis, pricing analysis, segmental and regional growth comparison, Automotive Parts Remanufacturing industry growth analysis and segment-level projections in an inclusive representation. According to PMR’s research, the global Automotive Parts Remanufacturing market is anticipated to register a value CAGR of 6.9% during the forecast period. Growing manufacturing industry and increasing production activities are the two prime factors expected to drive the global Automotive Parts Remanufacturing market during the forecast period. PMR’s report on the Automotive Parts Remanufacturing market analyses the market at regional and global levels through market segmentation on the basis of key parameters, i.e. components, vehicle type and region/country. Market consolidation is one of the key trends observed during the Automotive Parts Remanufacturing study. Importantly, Automotive Parts Remanufacturing happens primarily through authorized dealers or component assemblers in the global market. The global Automotive Parts Remanufacturing market report starts with an overview of the market, which provides a summarized view of the report and also provides market definitions and taxonomy. In the subsequent section, the report defines the market viewpoint, which includes macroeconomic factors, forecast factors, value chain and various other qualitative data regarding the market. The section that follows discusses market dynamics, such as drivers, trends, restraints and opportunities, impacting the global Automotive Parts Remanufacturing market. The global automotive Parts Remanufacturing market can be segmented on the basis of components, vehicle type and regions/country. The following sections of the report provide global market value (US$ Mn) and volume (‘000 Units) projections for the aforementioned segments. The global market values represented in these sections have been derived by gathering information and data at country as well as regional levels. The next section of the report provides a concise view of the global Automotive Parts Remanufacturing market based on seven prominent regions considered in the study. The section presents regional market positions, growth potential and market attractiveness analysis for each of these regions. In addition, it is imperative to note that in an ever-fluctuating global economy, we not only conduct forecast in terms of CAGR (Compound Annual Growth Rate) but also analyse the market on the basis of key parameters, such as Year-on-Year (Y-o-Y) growth, to understand the predictability of the market and identify the right opportunities available for value chain participants. Another crucial feature of this comprehensive report on the Automotive Parts Remanufacturing market is the analysis of all key segments, along with revenue forecasts, in terms of absolute dollar opportunity. This is traditionally overlooked while forecasting the market; however, the absolute dollar opportunity is critical in assessing the level of opportunity that a provider can look to achieve in the Automotive Parts Remanufacturing market. In order to offer an accurate forecast, PMR started by sizing the current market, which forms the basis of how the global Automotive Parts Remanufacturing market is expected to develop in the coming years. Given the characteristics of the global Automotive Parts Remanufacturing market, we triangulated the outcome of different types of analysis, based on primary research, secondary research and our own analysis. However, forecasting the market in terms of various Automotive Parts Remanufacturing segments and regions is more a matter of quantifying expectations and identifying opportunities rather than rationalizing them after the completion of the forecast exercise. 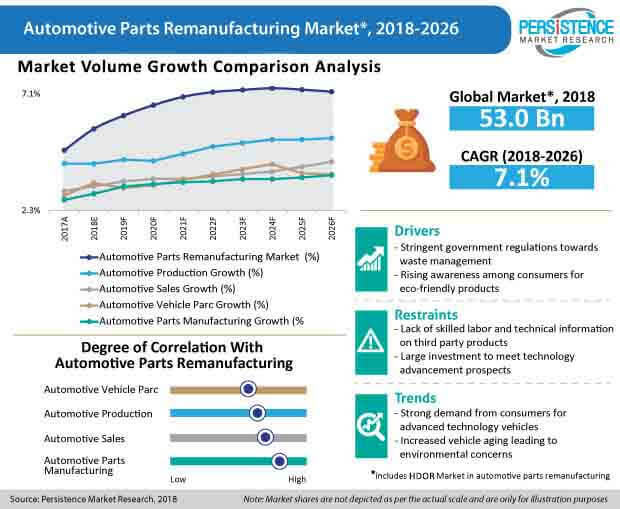 In the final section of the report, PMR has provided the global Automotive Parts Remanufacturing market structure and a detailed competition landscape to provide a dashboard view of key players operating in the global Automotive Parts Remanufacturing market along with their business strategies to report audiences. This section is primarily designed to provide clients with an objective and detailed comparative assessment of the key providers specific to a market segment in the value chain of the Automotive Parts Remanufacturing market. Automotive parts, after a certain period of usage, undergo wear and damage, and require replacement. Automotive parts will thus continue to witness significant demand in the aftermarket, which in turn is likely to create multiple growth opportunities for the automotive parts remanufacturing market players. Attractive cost savings and profitable margins associated with the automotive parts remanufacturing market have been securing a profitable position for automotive remanufacturers over the years. Remanufactured parts cost nearly 50-75% as much as the original product - while providing the same quality, which remains the key booster to demand growth of remanufactured parts. The global automotive parts remanufacturing market is estimated to grow at a value CAGR of 7.1% over 2018-2026, roughly equating US$ 91 Bn by the end of 2026. By component, electrical & electronics parts are projected to lead the automotive parts remanufacturing market in terms of value. The growth of this segment can be primarily attributed to increasing rate of replacement of alternators and starters. Engine and related parts also hold a significant value share in the automotive parts remanufacturing market, i.e. over 30%. On the basis of application, the passenger cars segment is projected to register the highest CAGR growth and account for 37.1% of the total market share in the automotive parts remanufacturing market. Growing individual buying power and growing need for personal commute are some of the factors responsible for the growth of the segment in the global automotive parts remanufacturing market. On a regional level, North America is projected to retain the lead in global automotive parts remanufacturing market, in terms of revenue share. Europe is estimated to follow North America and will reportedly generate significant demand for remanufactured automotive parts in the coming years. In terms of growth rate, China is estimated to lead the automotive parts remanufacturing market, followed by Latin America and South East Asia Pacific, as these regions are witnessing high volume automotive sales, subsequently followed by notable demand for automotive parts. With improvements in material and technology used for automotive manufacturing, the average operational age of automotive vehicles has increased substantially. The number of vehicles more than 12 years in age is projected to increase by 15% over the next five years. The number of vehicles that are 16-24 years old increased 1.3X in 2015 as compared to 2000, which is expected to create significant demand for automotive parts remanufacturing market. The global automotive parts remanufacturing market is fairly fragmented, owing to the presence of a number of large multi-national corporations, followed by a fair share of domestic players spread across various regions. The tier-I players are estimated to occupy approximately 25% - 30% of the automotive parts remanufacturing market, while the tier-II players are estimated to account for approximately 35%-45% of the market share. Tier-III players are estimated to account for approximately 25-35% of the market share in the automotive parts remanufacturing market. Some of the key global market leaders in the automotive parts remanufacturing market are Volvo AB, Robert Bosch, BBB Industries, Cardone Industries, Valeo SA, Meritor Inc., ATC Drivetrain LLC, and Motor Parts of America, among others. How is the automotive parts remanufacturing market expected to grow over the projected period? What are the key factors driving the automotive parts remanufacturing market? What direction is the automotive parts remanufacturing market expected to take in terms of volume and value during the forecast period? What are the predominant trends in the automotive parts remanufacturing market? What are the major macro-economic factors impacting the growth of the automotive parts remanufacturing market? What are the key opportunities in the automotive parts remanufacturing market for manufacturers? What are the factors hampering the growth of the automotive parts remanufacturing market?